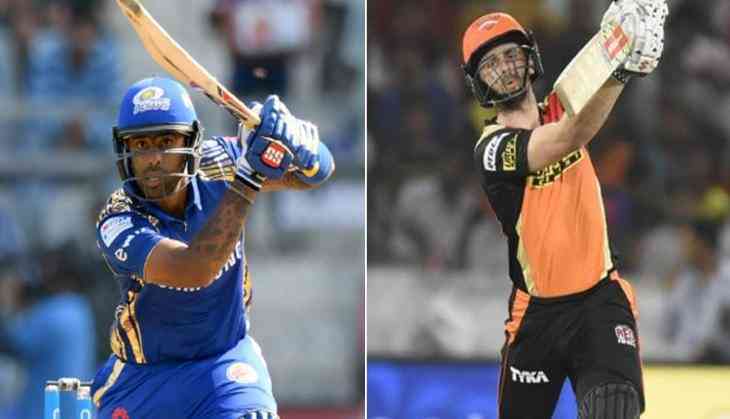 Mumbai Indians won the toss and chose to field first and invited Sunrisers Hyderabad to bat first. Shikhar Dhawan recovering from the injury came to open the innings but was hit on his knee by the ball and apparently hurt. He couldn't do much with his bat and got out at a paltry score of 5 after playing 6 balls.Skipper Kane Williamson played a nice inning but couldn't add more than 29 runs to the scoreboard. Later, no one could provide Mumbai with a substantial inning and kept falling one after the other. Yusuf Pathan made things cool for a while but could not make his innings go further 29 runs. SRH ended up giving a rather small target of 119 runs to the Mumbai Indians. The Mumbai innings started on a rather dull note where opener Suryakumar Yadav tried to stabilize the innings but no one actually stayed long enough with him to provide Mumbai Indians with a firm base. Skipper Rohit Sharma could not do much with his bat and went down for only 2 runs off 6 balls. Thereafter Krunal Pandya was the one who stayed for some time on the crease but could not more than 24 runs to the board. 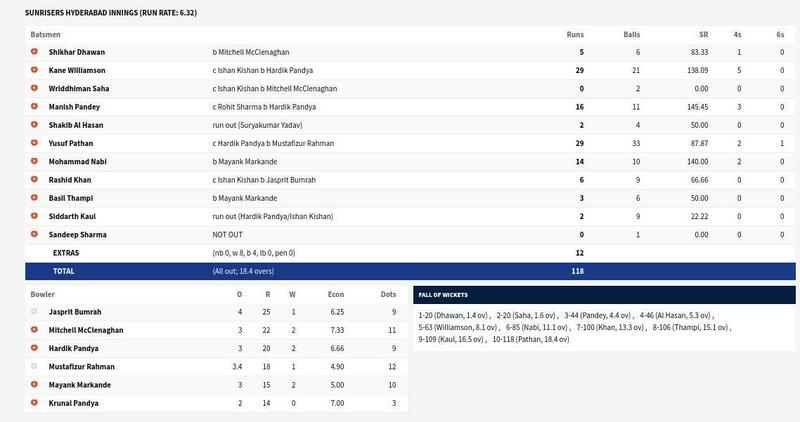 The score of 118 set by the SRH that looked like an easy task to achieve turned into a nightmare for the Mumbai. Hyderabad bowlers turned hostile and did not allow any of Mumbai's batsman to loosen their hands. Mumbai, at last, succumbed to the SRH assault and was bowled out at 18.5 overs.